Don’t have that embroidery machine yet, don’t fret. It is impossible not to go “aww” when you work with the art of Bonnie Sullivan. This quilt will explore all the decorative stitiches on your machine, playing with hot fix crystals, buttons, cording and much more. Each month we will explore different avenues of embellishment for your quilt. 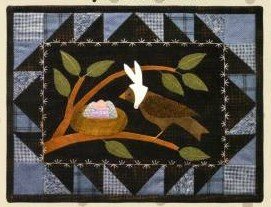 Please join us for this utterly charming quilt.